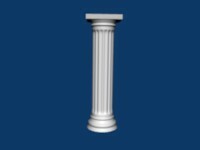 Building a Greek looking column in Blender3d. Before beginning, it's a good idea to look at images of different columns for reference. First get rid of the default cube. Select it by Right mouse clicking it, hit X on your keyboard. (erase selected objects) click ok.
Hit 7 on the number pad to select top view. Spacebar - Add > Mesh > Circle. (32-vertices). See image. By default you are now in Edit Mode. Hit 1 on the number pad for front view. 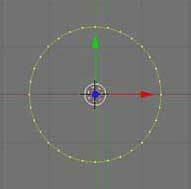 Be sure all vertices are selected. Hit E to extrude then Z (we want to extrude upwards on the z plane). Your work should look like the image. Go back to top view. 7 on the number pad. De-select all of the 32 vertices by hitting A. Now you see 32 pink vertices. Here's the fun part. If you look at a column, you notice grooves running up the column. That's where we begin. There is probably a quicker way to do this but this is how I did it. Zoom your view in a bit by hitting +plus on the number pad. Now hold in B on the keyboard until your curser becomes a circle with crosshairs in it. 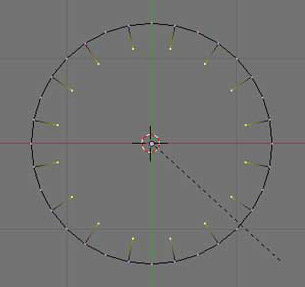 Next hit -minus on the number pad a few times to make the circle small enough to select one vertex. 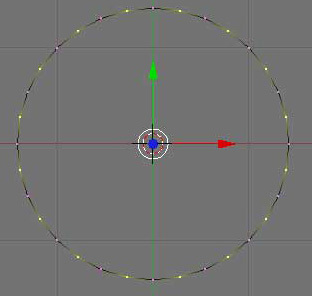 Go around the circle and select every other vertex. See image. Now hit E to Extrude then hit Esc (escape). On the keyboard. Then hit S to Scale and then hold Ctrl. And move the mouse cursor inward two spaces. Hit enter. See image.